This is a useful field guide meant to help veterinarians treat simple and complex eye problems in horses. 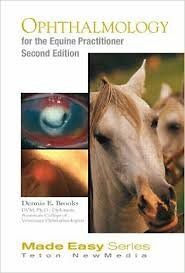 The book is to the point and focuses on salient clinical facts, covering the most common medical and surgical ophthalmic problems encountered in an equine clinic. The book is laid out in anatomical order making it easy to locate specific information. The sections include General anatomy and physiology of the horse eye, Examination of the eye of the horse, The equine orbit, Eyelids, conjunctiva, nictitans and nasolacrimal system, Corneal ulceration, Other corneal problems, Cataracts, glaucoma and uveal tract disease, Retinopathies, and Lavage treatment systems. Within each section there is a logical guidance to the diagnosis and management of common clinical problems. A short but highly informative section on vision in the horse is particularly valuable for the practitioner. This portable resource for the non-specialist provides clear guidelines for evaluation, diagnosis, and management of medical and surgical problems. The accompanying CD contains 29 video clips of 40 minute duration covering diagnostic and surgical procedures. Among the videos are the information of tonometry, cataract surgery, orbital blocks, equine recurrent uveitis, retinal detachment, and ketatoplasty.